In a large oiled pot on medium heat sweat your onions with some salt and pepper until the onions are translucent, then add you garlic and shallots. Sweat that all down then add your asparagus, green onion and basil. This should all continue to cook down. You can slowly add your stock to deglaze if needed. Then add your 2 cups of peas. If the peas are fresh keep the heat the same, if they are frozen you can crank the heat up to a medium/high heat. Once everything begins to break down, add the rest of your stock and bring the contents of the pot to boil. After the boil take the soup off heat and allow it to cool enough to safely blend. Add your half stick of softened butter while you blend the soup, I like using an immersion blender it makes for much less mess. Once the soup is blended check the colour if the green isn’t enough for your sensibilities adding arugula or spinach to give a little bit more green to the soup. 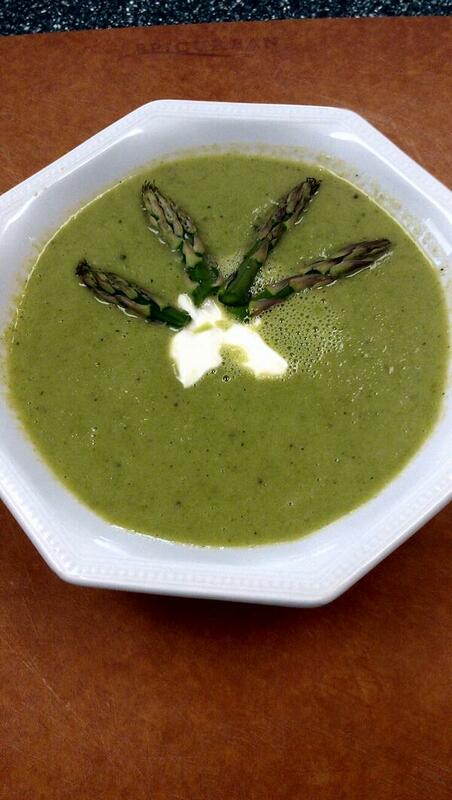 I like to garnish the soup with a little sour cream and the asparagus crowns. Enjoy! *Ladies I am sorry but guys are not going to flip out over the colour of your soup. **Bending the stock of asparagus with your fingers on each end will cause it to break somewhere in the middle. Generally where it breaks is where the quality of the vegetable is at it’s best. So from crown to break would be kind of the fillet mignon of the asparagus. Also reserve some asparagus crowns for your presentation. This entry was posted in art, Cooking, Depression, Education, Food, Food Reviews, How To, humor, Ontario, Photography, Photos, recipes, Travel, Uncategorized and tagged Asparagus, asparagus crowns, Cooking, eating, Food, Green Onion, peas, recipes, soup, Spring, Spring Food, vegetarian, vegetarian cuisine, Vegetarian Recipes. Bookmark the permalink.